In 2009, I was asked by So. Calif. Women’s Caucus for Art President, Sandra Mueller if I would like to write the Women Around Town column for the organization’s monthly e-newsletter. As an art historian who had been teaching and researching women artists for several years it seemed like a wonderful opportunity and responsibility. And so I have been writing the column every month since then. I highlight women artists who are exhibiting in So. California, visit their exhibitions, bring attention to their work, describe what they are doing, and at the same time provide some documentation. In 2014, the National Museum of Women in the Arts, provided the following data: “51% of the visual artists working today are women, they account for just 5% of the in the U.S. Museums-are featured in just 2% of the solo exhibitions..and represent just 10% of artists featured in art books.” This further inscribes the fact that what I write about each month matters, regardless of how many people read my column. I have taught numerous classes at the University about women in the visual arts bringing attention to women artists who have been omitted from the textbooks and I have proudly inserted many women artists into the curriculum of traditional art history survey courses over the years. This has become a natural course of action for me and I hope that someday those statistics provided by the NMWA won’t be so low. 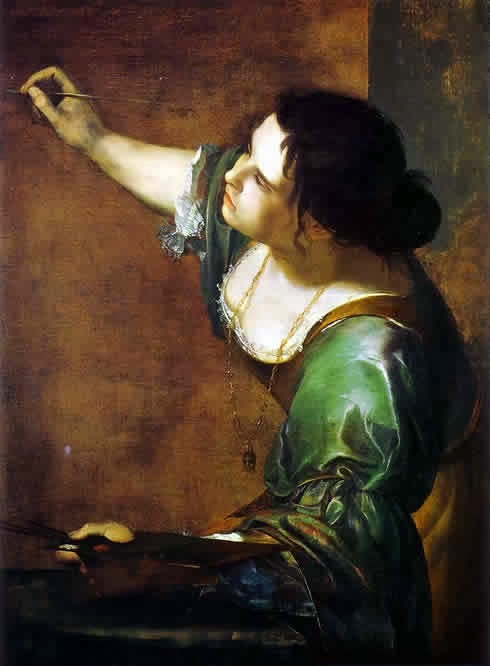 I still however get quite disappointed when not even 1 of my 72 students has even heard of Artemisia Gentileschi, the highly skilled 17th c. Italian Baroque artist whose Self-Portrait as the Allegory of Painting is featured here. (OK…they haven’t heard of her father Orazio, or many other Italian Baroque painters either). I will get over it. Each month as I set aside the time to acknowledge those local women artists for my column, I think of Artemisia and the others and the responsibility I have embraced to give them notice. Here on my blog, (once again with a nudge from my friend Sandra Mueller who encouraged me to create a blog) perhaps my writings will have a permanent home and my efforts and the women artists will be not be forgotten. This is great!! Your efforts are appreciated. Congratulations, Karen, and thank you for all you do!